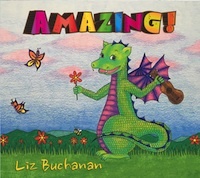 Here are the lyrics to the songs on Liz’s four CDs, “Amazing!,” “Once Upon A Tune,” “Singing All the Way Home,” and “Make it a Song, Song, Song.” Go to the Order CD page to find out how to purchase these recordings. All songs are © 2016 by Liz Buchanan unless otherwise indicated. So he added some people, and what do you know? From a blank piece of paper, something to last. With a little bit of time and encouragement, too. We’re up in the morning – it’s a brand new day. Let’s give it a go, hey what do you say? Where the kids would go and learn a lot. And a chorus that pulled together everything. That every idea has room to grow. No fire, today, dragon, no fire! No fire, hey, hey, I said, no fire! Be friends, okay? I said, no fire, that’s right, no fire! Is it time to eat our lunch? Eat apples to make a crunch. And please, Mr. Dragon, not my cat! Swords flash to castle heights. But might there be a better way? Instead of fighting, why not play? Very simple: I just eat. I like to eat, don’t you know? I eat and eat so I can grow. I’m very hungry – aren’t you glad? It’s the best lunch I ever had! I’ll be hangin’ out in a cocoon. And watch me as a butterfly! I’m a very hungry caterpillar, yum, yum! It’s a good thing he’s extinct. Fierce and frightening, so big – wow! Who’s that creature? Tell me now! Study all those dinosaur bones. Found a huge one, so big, wow! Who’s that creature? Tell me now. It’s a T-Rex. It’s a T-Rex. Tell me about that T-Rex – tell me everything. Tell me about that T-Rex – tyrant lizard king. He eats meat – He eats me! Aaaah! What could I become? I’m just a little seed. I could be a sunflower. I could be a tree. ‘Cause I’ve got potential – I’ve got potential. I’m a little seed – I’m a little seed. I could be a redwood, and grow 300 feet. Wow! I need some help growing – I can’t do it alone. And take care of the earth, to keep us all around! I could be a daisy or a coconut tree. (Chorus) I wish I knew how to fly, like fairies, birds and Superman! If we could fly, what would we see? An eagle soaring, proud and free. Above me, yellow sun so bright. If we could fly, where would we go? We’ll go swimming when we land! So she took a piece of paper and made a great big dot. And Vashti discovered that art was lots of fun. Keep on adding more – lots and lots and lots! That you can be an artist – DOT! – oh, yes, you can. You can be an artist – DOT – oh, yes, you can. Dots both old and new. All day long, watch the tortoise go. Plodding along, his steps so slow. Hare, so fast, zip-zip fast. Hare so fast, zip-zip fast. ‘Cause I know I will win first place! Watch that hare go go go! Watch that hare, hopping fast! Tortoise, he will come in last. So says the hare, “This race is a snap. Give me an H – H! Give me a 2 – 2! Give me an O – O! What do you get? Water! It’s water, oh water, all kinds of life need water. For animals, for people, for plants and trees. Water, oh water, we’re singing: H2O for you and for me! H2O for you and me! Water, oh water, we’re singing: H2O for you and me! We’re singing: H2O for you and me! H2O – for all life to be! Give me an H! Give me a 2! Give me an O! A whole world waiting for us to explore. Wings to fly, friends at my side. With heroes as guides, the stories inspire. I learn from them as I find my fire! Won’t you come on this journey with me? Imagine together so bold and free. With wings spread wide, the story begins. The season’s changing; the sky’s a steely gray. As the last signs of warmth slip away. But inside my heart, there’s a rainbow. Inside my heart, there’s a smile. And it’s going to keep us warm for a while. Won’t you come inside with me, where the fire is warm? And together, we’ll write our winter song. For inside my heart, there’s a rainbow. Fill the world with light. And it’s going to keep us warm for awhile. I like to sing … a song of spring. And though there might be rain, there’s a rainbow on the way. 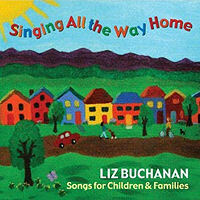 All songs are by Liz Buchanan © 2012 unless indicated otherwise. Adapted from “All Around the Circle” by Ellen Allard, © 1999, 80-Z Music. If you’ve got a story, come and tell. If you play the drum, let’s hear it now! If you play the fiddle, let’s hear it now! Now join the band, come into the circle. Wave your hands and say hello! Hola! Namaste! Konnichiwa! Jambo! We’re all in the circle, cockadoodle-doo. Cockadoodle-doo! Goldilocks, Goldilocks, they could give you quite a scare. In the woods, she found a house, she gave the door a knock. But the owners weren’t at home, and it wasn’t locked. But what happened to that girl, she never would have guessed, oh! And when she broke the smallest one, she thought she’d go upstairs. And there she found three beds, the small one looked just right. She lay down and fell fast asleep, though it wasn’t even night. (Spoken) But before long, who came home? Someone had come into their house, ate their food, and broke a chair! Goldilocks woke up to find three bears all around her. She jumped up and gave a scream – “Eek, three bears!” Not a dream! She jumped out the window and ran away – enough adventure for one day! Hair gathered up in a tip-top turple. Walking down the street, she encountered Mr. Blue. He said, “I’m thinking fondly of dear Miss Red. Mrs. Purple said, “Why that’s a happy fix! What color, what color will you be today? Maybe pink or yellow as a flower in May? Or maybe as blue as the deep blue sea. What color, what color will you be? Soon our friends met up with brilliant Mr. Orange. He said, “I think Miss Red should meet Mr. Yellow. Then said Mr. Blue, “I don’t know what to do! What will Miss Red become if she seeks another hue? A dab or smear of charcoal, sienna or gray? Or maybe the green of a tall pine tree. And then to shake things up, along came Mrs. Green. The world was always brighter when she came on the scene. For more green would be lovely, it certainly was true. If they all blended up, they’d look something like brown. She hoped that every color would get a chance to shine. Or a whole rainbow for everyone to see! At last, all joined as friends, those reds, yellows and blues. A world of many colors, happy through and through! Any garden at all! Oh, no! Yeah, they’re playing and having a ball. Spoken: Well, it’s pretty quiet. Maybe it was just a bug. I’ll go back to my farm. Oh, along comes a cow. She’s stomping on the hole. Spoken: Mmmm, it’s awful quiet down there. Maybe it was just a bumble bee. I’ll go back to eatin’ grass and makin’ milk. Oh, along come some kids, they’re stomping on the hole. Spoken: Well, the kids are pretty smart. They know it’s not a bug or a bumble bee. Who’s down there, kids? Spoken: That’s right. Maybe if we call to them, they’ll come out. Kids: Oh, bunnies! Come out and play! Here they come! Once upon a time there were three billy goats, three billy goats gruff. Once upon a time there was a mean old troll, who made their lives so rough! On the way to the meadow, trip trip trup. “Who’s stomping on the bridge?” said the mean old troll. Who started to think fast. Who’s coming soon to eat grass. “Okay,” said the troll, and he let the Billy Goat go. And so the third Billy goat thought very hard – and he remembered what he could do if he just tried! Spoken: And he looked like he meant it (even though inside he was sort of scared to death). If I were a troll, I wouldn’t hang around, would you? So the troll said, “Oh! No!” And then the troll said: “Gotta Go!” And with that, the mean old troll skee-daddled down the river! Where they all ate grass and got so fat. Fly away, Rob, fly away, Ree. Come back, Rob, come back, Ree. One named Bob and one named Bill. Come back, Bob, Come back, Bill. Swim away, Fred, swim away, Fee. Come back, Fred, come back, Fee. Five little mice come out to play. Then four little mice will run away! Four little mice … etc. One little mouse comes out to play. That mouse is going to say: “You great big bully, go away!” Way to tell ‘em! Begone, Cat! And mice everywhere will cheer! Adapted from “Thorn Rosa,” a traditional singing game. Gender-neutral lyrics by Liz Buchanan & Amy Conley. There were once four royal children, children! A castle wall, that was oh so tall. They lived inside a castle wall, a castle wall. Spoken: And the children fell sound asleep. Spoken: Yes, the years passed: 10-20-30-40-50 years. And they tried to burn that castle down, castle down. Yes there came along a valiant knight, so brave and true. Spoken: And the children slept on, as many more years passed: 50-60-70-80-90-100 years. Yes, they all lived happily ever after! hasta el otro dia, duérmen los pollitos. When they’re feeling hungry, when they’re feeling cold-o. Baby chicks are sleeping until the next day. Oh mother dear, see here, see here, our mittens we have lost! What? Lost your mittens – what silly kittens! Oh, where, where could they be? All your toys and books and clothes. And she knows that you can, too. Miaow, miaow, miaow, miaow. Repeat. Oh mother dear, see here, see here, our mittens we have found! Oh, found your mittens – what smart little kittens, sweet kittens I adore. They were right there where you left them, on the kitchen floor! All their toys and books and clothes. You just need to use your brains now, just like your super mom. Miaow, miaow … like your super mom. Sometimes Y is added, too. Cool cats in my cereal, cougars who can cook. And famous frogs are fabulous, if I say so myself. And hooray for happy hippos who are helping out a hen. And koalas meet the kangaroos in the best “Down-under” style! Give mulberries to the mules, mangoes to the minks. Then poodles wearing pompadours will quickly say quack quack! While the slippery, slithering snakes sure know how to get down. Or if the vultures vanish when I wear my velvet boots! While my xylophone plays excellently up in yonder tree? Then zebras in the zoo will zoom off to the moon! All that is there to be. We’ll give it all we have until the day is done. Just like yesterday, and today. They call us best friends, and I know that’s true. Sometimes I do thoughtless things, I’m sorry. We both say things we did not mean to say. Before time steals away, time steals away. 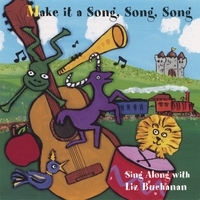 All songs are by Liz Buchanan ©2009 unless indicated otherwise. Then we can be friends! A fun book about saying hello in many languages is Manya Stojic’s Hello World! : Greetings in 42 Languages Around the Globe! Scholastic, 2002. All the way home, singing all the way home. Then comes the sun and it shines down warm, and one day the chrysalis opens wide. And what comes out? A butterfly! They spread the nectar, don’t you know? From the jungle to the plain. Let’s feel the rhythm in our hips. No. 8 – Hurry up if you’re running late. No. 7 – Sun’s comin’ out and I’m in heaven. No. 6 – I’ve got a red wagon that I need to fix. No. 5 – The bees are buzzin’ all around the hive. No. 4 – You wanna come in, just open the door. No. 3 – Oh, you and me, we’re gonna climb a tree. No. 2 – I found my sock, but I lost my shoe. No. 1 – Singin’ with you is so much fun. Feel the rhythm all over! Think of food words, start with one. Clap more food words, now it’s two. Some new food words, make it three! So much great food, time for four. Two opposites are what you’ve got. All you lucky children, come and eat it up, come and eat it up. Zingo, zango, cutting with my saw. Jump inside when the cold wind blows, and give a kiss to the baby-o. Chorus. Oh, our love would truly rock! And don’t forget how those sauropods rock us! You never know what he’ll do next! If you’d be my prehistoric valentine! And a hat, how ’bout that? Oh no – it’s gonna snow! They wanted to build a house. They wanted to keep him out. And he was feeling fine. (Spoken) So he huffed and puffed and down went the house of straw! And the little pig scrambled off to find his brothers. He wanted to keep him out. That wolf was such a louse! He huffed and he puffed … but he could not blow that house down. Where that bad wolf would get cooked. And that was the end of the big bad wolf! ever after in that house of bricks. works better than straw or sticks! With a shield and a sword? Oh no, uh uh. Fight a fire, with a shield and a sword. (Chorus) Make a siren sound! The siren means get out of the way. With water in the hose? Oh yeah, uh huh! You’ve got to fight that fire with water in the hose. Fight that fire, with water in the hose. Which creature thinks a nest is the best? A bird! Who stays alive in a hive? A bee! Who lives in a den and lets out a roar? Lions and tigers and bears galore! Who makes a home ‘neath the sea? Fish! Who gets to dwell in a shell? A crab! Who lives in the waves just beyond the shore? Eels and octopus and whales galore! We all need a home that’s safe and warm. To protect from the wind, the cold and storm. I’m thankful for my comfy bed. We all need a comfy bed! Chorus. 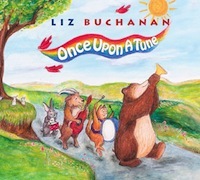 By Guy Davis, Liz Buchanan & Gordon MacFarland, based in part on the tune of “Blackberry Ramble,” with new lyrics by Liz Buchanan & Gordon MacFarland. © 2005 Medicine Hand Music, administered by Royalty Tracking Music, BMI. © 2010 Antelope Dance Music. Down on the ground or way up high. What’s that out there in the grass? Seems to be falling down. So much rain, tell me why. Feel the sun upon my face, and all the world is new. Traditional poem, with additional lyrics and tune by Steve Roslonek, © 1999 SteveSongs, Inc.
All songs listed below are traditional folksongs in the public domain, except where indicated. What Shall We Do with a Lazy Katie? Just jump right up, don’t miss your chance to be doin’ the antelope dance. Go right ahead and shake your trunk, now you’re doin’ the elephant bump. Did I hear you say you never heard of antelopes dancin’, never saw a slug do the jitterbug? there just might be a warthog who can doo-wop-wop! That’s right, doin’ the antelope dance, oh yeah, doin’ the antelope dance. Chugga chugga ding ding, chugga chugga ding ding, comin’ to a railroad track. The gate comes down, the sign says stop! The red lights flash So we won’t crash. Chugga chugga ding ding, chugga chugga ding ding, stop and let the train go by. The gate goes up, do we have to stop? No! The red light’s off, so we can go! Chugga chugga ding ding, chugga chugga ding ding. Now we can be on our way. If I lived in a castle, I wonder how it would be. If I lived in a castle, I wonder who I’d see. ‘Twas my own heart dilly dilly, that told me so. While you and I dilly dilly keep ourselves warm. It’s a frog, can you hear it? Ribet, ribet! It’s a bird, can you hear it? Tweet, tweet-tweet! And make it a song song song. And make it a song song song. It’s a drum, can you hear it? Boom-bah-boom, boom-bah-boom! It’s a horn, can you hear it? Toodle-oot, toodle-oot! It’s a racecar, can you hear it? Vroom, vroom, vroom, vroom! It’s a sailboat, can you hear it? Wait – I can’t hear it! And so on . . . for about 8 more times!! And you eat it, you eat it, you eat it eat it eat it YUM YUM! Peanut, peanut butter and jelly. Peanut, peanut butter and jelly. There’s a hole in the bottom of the sea . . .
There’s a log in that hole in the bottom of the sea . . . In that hole in the bottom of the sea. There’s a knot on that log in the hole in the bottom of the sea . . .
There’s a skeeter on the knot on the log in the hole in the bottom of the sea . . .
There’s a hair on the skeeter on the knot on the log in the hole in the bottom of the sea . . .
There’s a hole in the bottom of the sea…. Yes, a hole in the bottom of the sea. What shall we do with a lazy Katie, early in the morning? Hooray and up she rises, early in the morning. Put on her shoes and her stocking cap, early in the morning. Brush all her teeth and comb her hair, early in the morning.